Figure 1. Millions of non-disabled Americans aged 51 and older in various scenarios, 2014–2050. 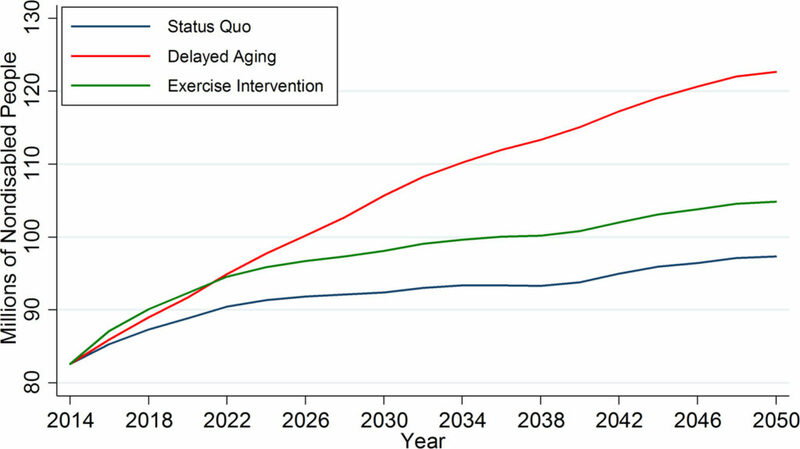 Dana P. Goldman, Étienne Gaudette, and a colleague argue that evidence is growing that the disease-specific model of biomedical innovation is reaching its limits, and that the United States’ real and intellectual capital should be shifted to a delayed aging focus. With some notable exceptions, the US insurance model is not designed to pay for preventive services—like walks—that might keep people healthy, but rather for treatments when they are sick. As people age, they are at less risk of falling victim to a single isolated disease. Instead, competing causes of death more directly associated with biological aging—including heart disease, cancer, stroke, and Alzheimer’s disease—cluster within individuals as they reach older ages. These conditions elevate mortality risk and create the frailty and disabilities that accompany old age. The authors propose that the time has come for the US to begin a real discussion about how best to help Americans achieve longer, healthier, and more productive lives. The full article is available at American Journal of Preventive Medicine. Citation: Goldman, D. P., Gaudette, É., & Cheng, W. H. (2016). Competing Risks: Investing in Sickness Rather than Health. American Journal of Preventive Medicine.